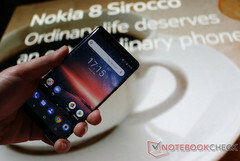 Finnish company HMD Global, has announced the new Nokia 8 Sirocco, the first flagship phone to be part of 'Android One.' Internal specs remain mostly identical, but the design has been revamped with impressively small bezels for a phone that retains the 16:9 aspect ratio. The new Nokia 8 Sirocco has had a redesign, with the edges getting a larger screen-curve that is reminiscent of the Samsung Galaxy S8. Some will find the curved edges more difficult to hold, but they certainly add a premium look befitting a flagship device. The frame is stainless steel, which HMD claim is 2.5 times stronger than the 6000-series aluminum commonly used for smartphones. Due to the tapered back, the edge of the phone only measures 2 mm, but the phone is actually a similar thickness to the previous generation. The screen is a 5.5-inch pOLED panel that is still in the traditional 16:9 aspect ratio. This makes it around half a centimeter wider than a similar 18:9 (2:1) phone, but conversely, it will also be around a centimeter shorter. The resolution is 2560 x 1440, and by shrinking all four bezels, HMD has managed to provide a screen-to-body ratio far higher than older 16:9 phones, looking much closer to that of an 18:9 device. Most flagship phones release with 18:9 displays now, but this gives consumers a choice between stretching across a wide screen or up a tall screen. Those who want the most screen real estate possible for watching video content without zooming/cropping will appreciate this option. The Snapdragon 835 is used again (rather than the Snapdragon 845), along with 6 GB RAM and 128 GB of storage. 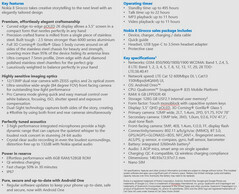 The top-end configuration of the Nokia 8 (2017) was also available with these specifications. 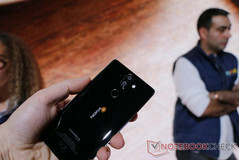 The cameras consist of a 12 MP primary sensor paired with a secondary 13 MP sensor/telephoto lens, and the Nokia Camera app has been updated with improved manual controls. The front camera is a single 5 MP sensor. Unfortunately, the 3.5mm headphone jack is gone. While this is an annoyance to those who prefer audio from an analog jack, or for those who don’t want the inconvenience of using an adaptor or the expense of new headphones, the tradeoff is that manufacturers are more easily able to waterproof the phone. The Nokia 8 Sirocco is rated IP67 dust and water resistance, compared to the Nokia 8 (2017) which was only IP54 splash proof. Finally, the Nokia 8 Sirocco is the first — and so far only — flagship class phone to be part of ‘Android One.’ This promises prompt security and software updates over the product's lifespan, a potential advantage over its contemporaries. The Nokia 8 Sirocco is expected to release in mid-April with a retail price of €749 pre-tax (US$920).